2010 was a big development year for us with an amazing amount of tangible progress on the Next Generation Schema (NGS). NGS would prove to be our number one task in 2010, with no server releases happening at all because of our focus on NGS. Early in the year we increased our engineering capacity with Kuno Woudt joining us as a full time developer in February; Oliver Charles moved from a part time position into a full time position in June 2010. Their sole focus for the entire year was to finish NGS, and we got within a few months of finishing it. We transitioned from Subversion to Git as our version control system in the process of writing NGS. From Nov 2009 to Feb 2010 the MusicBrainz Server codebase went from ~224,000 lines of code down to ~72,000 (the lowest since 2003!). By the end of 2010 we reached ~130,000 lines of code. NGS does a lot more, but with a lot less code. NGS was a much needed cleanup and overhaul of our aging codebase. Financially we started 2010 off pretty weak, but got an early boost with a $50,000 donation from Richard Jones (one of the founders of last.fm) and later a $40,000 donation from Google. These generous donations allowed us to continue focusing on NGS — thank you Google and Richard Jones! MetaBrainz took on The Guardian, musiXmatch, and ZeeZee as new data customers in 2010. Google Summer of Code 2010 resulted in an exciting new addition to our product line – the MusicBrainz Android App. Developed by Jamie McDonald, the Android app allows anyone to carry the MusicBrainz Database around in their pocket wherever they go. It is a very handy app to settle music debates at parties! Jess Hemerly conducted a study and wrote a paper on MusicBrainz as part of her Master’s program at the UC Berkeley School of Information. Among many other topics, she answered questions such as ‘Why do people contribute?’, ‘What characterizes editors’ participation?’, and ‘What is the role of metadata in music technology?’. In 2010 the foundation took in $177,740.94 and spent $172,904.94 for a total excess income of $4,836.00. In 2010 the foundation spent $22,355.15 on hosting and hardware costs and served out 3.2 billion web hits and 1.5 billon web service hits. Calculating a cost per hit, we find that we spent $6.93 per one million web hits and $14.50 per one million web service hits. Compared to our 2009 figures of $8.66 per one million web hits and $14.37 per one million web service hits, these numbers didn’t change much. End-user donations via PayPal came to $6,867.99 which is roughly 10% less than last year. End-user donations came to less than 4% of our overall income due to the much larger role of sponsors such as Google and Richard Jones. Development costs in the form of salaries paid to Robert Kaye, Oliver Charles, and Kuno Woudt came to $109,991.19. It is amazing what we were able to accomplish with such a limited budget for paid engineers. In 2010 we earned $52,682.76 from live data feed licenses and $5,100.00 from Creative Commons licensed data for a total of $57,782.76. This is up 28.8% from the total of $44,878.50 in 2009. The balance sheet for the end of 2010 showed the MetaBrainz Foundation with $77,011.94 retained earnings, a net income of $4,836.00, and cash assets totalling $81,847.94. The blue line represents the overall number of hits to musicbrainz.org and the red line shows how many of the overall hits were web service (API) hits. As in previous years, our web service hits represent about 85% – 90% of our overall traffic. Please note that in September of 2009 we switched to a more accurate method for keeping track of our overall web services hits. Prior to this, the graph shows the sum of the artist/release/track counts, rather than the total web service traffic. Our traffic grew considerably in the first half of 2010, but then leveled off for the second half of 2010. We don’t know what accounted for this leveling off, but we suspect that the lack of new features for the MusicBrainz server generally decreased interest in the project. MusicBrainz uses 6mbits of bandwidth per second and draws 21 Amps of current for a power consumption of about 2,310 Watts. 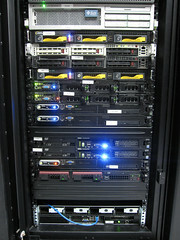 MusicBrainz physically occupies 20Us of space (half of a rack) at Digital West in San Luis Obispo, CA. 2010 was a challenging year for us, starting off with rocky finances, but support from Richard Jones and Google put us back on track. There were many people who thought that we could not ship NGS or that MusicBrainz would languish while we worked to complete NGS. Given that we had no server releases at all in 2010, we are pleased that the project remained relevant and that our community believed in us to finish NGS. MusicBrainz would like to thank its community of stellar editors (see above), its core developers (Lukáš Lalinský, Oliver Charles, Kuno Woudt, Aurélien Mino), our hero of system administration, Dave Evans and our goddess of bug tracking, bug fixing, editing and all things unicode, Nikki. We thank Jamie McDonald for the awesome Android app he wrote and we’d also like to thank Pavan Chander for all of his contributions. We’d like to thank Richard Jones, Google and every single donor who donated money to MetaBrainz in 2010. We’d also like to thank our board of directors (Cory Doctorow, Brian Zisk, Matt Wood, Rachel Segal/Carol Smith), our pro bono legal advisors Daniel Appelman and Ed Cavazos, our awesome hosting company Digital West and all of our customers. Finally, we would also like to thank the music teams at the BBC for their continued support and for motivating us to bring NGS to a close. Please update your local repos accordingly! Where origin is the name of the remote repo (run git remote -v to find that out if you’re not sure). Note: The previous path has been turned into a symlink to ease this transition, but it will stop working as of November 1st so make sure to update sooner rather than later!